Custom Touch Cabinets is a custom woodwork manufacturer located in Hubertus, Wisconsin, minutes north of Milwaukee. We specialize in face frame cabinetry for the entire home including kitchens, baths, entertainment centers and specialty millwork. Our team can design, build and install anything in wood. We serve both contractors and homeowners by supplying cabinetry and millwork for new construction as well as remodeling projects. We can supply just the woodwork for your project or offer a complete design, build and install package that includes plumbing, electrical, carpentry, drywall, counter tops, etc. Whatever your needs are in cabinets and millwork, Custom Touch Cabinets is pleased to offer our products and services to fulfill those needs. Experience the walk‑in bath backed by Kohler, designed with you in mind and rooted in over 140 years of engineering expertise. Our safe step‑in, extra‑wide door and easy‑to‑grip handrails keep you safe and secure as you ease in and out of your bath. And our hydrotherapy and BubbleMassage™ jets create a spa‑like experience, massaging your entire body as you soak. Give us a call to schedule your in‑home quote today. The Tub Doctors Inc. specializes in bathroom design and bathroom remodeling services in Milwaukee, WI and Waukesha, WI. We are a family-owned and operated business providing exceptional services and outstanding workmanship to all of our customers. Our commercial and residential clients can choose from a wide variety of different designs, colors, and patterns ensuring that the styles and features they select are best suited to their tastes and preferences. From tub refinishing to drywall painting, we offer a wide range of different services to best meet your remodeling needs. Each bathroom remodel is attended to with attention to detail and an eye for design to deliver a sophisticated and stylized finish. Our Bathroom Remodeling Services Include: Full & Partial Renovations Drywall/Painting Vanities and Vanity Tops Plumbing Medicine Chests & Mirrors Flooring Tub to Shower Conversions Barrier Free Showers Tub Refinishing & More Affordable Remodeling Services We are pleased to offer outstanding bathroom remodeling services at affordable prices. With The Tub Doctors, you will enjoy no payments or interest for 12 months, no application fees or closing costs, and no paperwork. Our affordable services make it easier than ever to have the beautiful bathroom of your dreams! House of Copper offers a unique product that has an artisan touch not found in all other products. We believe that our unique one-of a kind products we offer will give you joy each time you interact with them. We believe that finding manufactures which share our core values of quality, craftsmanship, attention to detail and customer focus are most important. Supplier of high quality home improvement products for the bathroom (both white and oak toilet seats) and home decor, including imaged wood wall art, decorative and functional wood crates, and imaged wood wall art. Tailor Made Products make safe, innovative, products of exceptional value for use in food preparation and cooking. For 29 years we have been transforming outdated kitchens into modern and more functional kitchens. Bath and kitchen products inspired by the realities of life At Sterling®, a Kohler® brand, we pride ourselves on designing reliable and affordable products that meet the real needs of real people. That's why our products can be installed quickly, can be cleaned with ease and offer proven performance day in, day out. And the sophisticated styling of Sterling products complements a wide range of decor - from warm and traditional to clean and contemporary. Full service design build kitchen and bath showroom. Whole home remodeling, additions and lower levels. 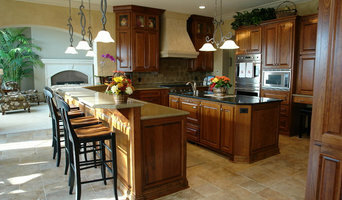 Stone and Banister has already made an impression in the market place by eliminating our customers fear of remodeling. Once your remodeling project begins, you too will be impressed by the quality of our craftsmen, the progress of the job and the professionalism extended during the project. If your house needs have changed, call us and we can expand your dream! “Creating beautiful spaces by incorporating detailed designs, high quality products, and expert installation.” Since 1965, The Kitchen Center has been creating exceptional designs to transform all areas of the home into beautiful living spaces. Our services and creativity has been provided to homeowners throughout Wisconsin. Whether it is a kitchen, bathroom, lower level or other rooms in your home, our experienced staff will create a personalized design for you and your family to enjoy for many years. We pride ourselves in producing very detailed plans and specifications, and to treat every project with the highest level of service, and on time completion. Through all our accomplishments we have built good relations with our customers, who continue to refer friends, family and coworkers to The Kitchen Center.